This photo features the Minneapolis Skyline, as seen just after Sunset on Super Bowl Sunday. So, yes, I did miss part of the game to be out in the sub-zero temps taking this photo. I have an admission to make. I have been dreaming about taking this photograph for two years. 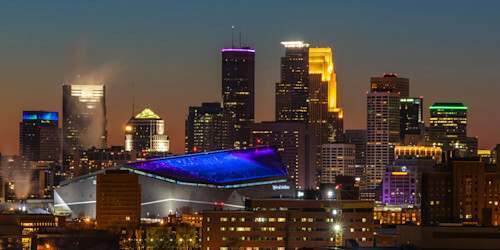 Ever since the new US Bank Stadium was built, and it was announced that we would have a Super Bowl here in Minneapolis, I have dreamed of taking this photo. Now, two things happened that were not part of my dream. First off, it was zero degrees, and the wind was blowing in my face the entire time I was up on Tower Hill and the Witches Hat Water Tower. You may look at this as one photo, click it and get back in my car. But I was up on that hill for 40-minutes, and this was the last photo that I took. I kept waiting for the right light, and I kept waiting for something else. My dream of this photo included searchlights pointing up in the sky. I mean, it IS the Super Bowl. But alas, no searchlights. I also didn't know about the purple and teal/blue colors they would use for the Super Bowl, and it was great seeing the city lit up like this. I missed the first quarter, and half of the 2nd quarter of the Super Bowl while I was out getting this photo. I knew I would miss that much of the game, so this was the one good thing about the Vikings not making it to the Super Bowl. I do not think I could have gone out to take this photo if the Vikings had made it. 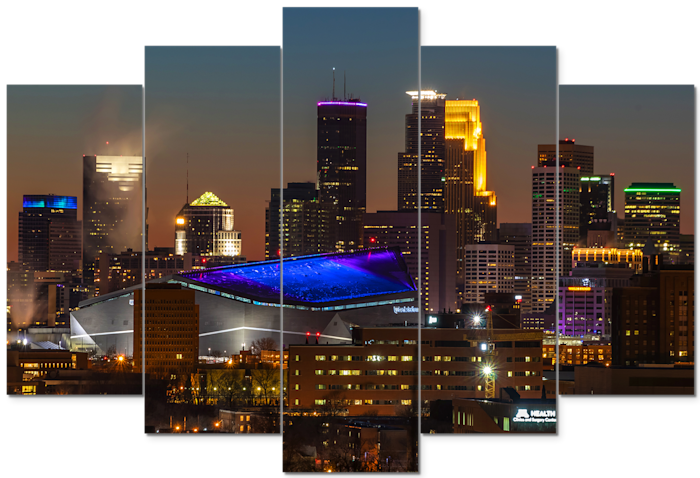 I hope you enjoy this Minneapolis Skyline Photograph, and please feel free to share it! 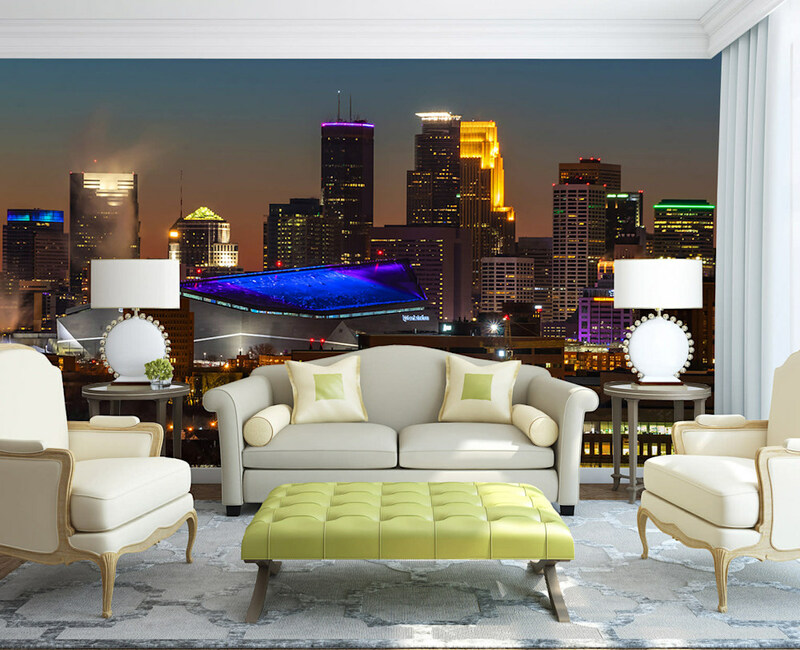 Super Bowl Minneapolis Sunset Photograph as Fine Art.